A Toronto-Section IEEE Fellow is the 2015 recipient of the Medal for Distinction in Engineering Education from Engineers Canada. Dr. Rose (right) is presented with the Medal for Distinction in Engineering Education by Leo Martins, representing Great-West Life Assurance Company, a sponsor of the Engineers Canada awards program. 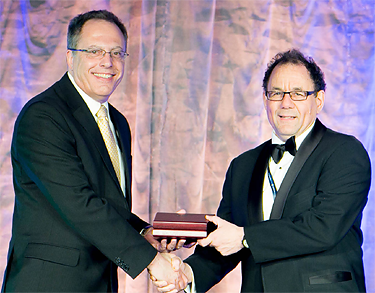 Dr. Jonathan Rose was presented his award at a gala in Calgary on May 21, along with eight other award recipients. The Engineers Canada awards program seeks to "highlight engineering excellence and contributions to the engineering profession, community, and the safety and well-being of Canadians." Dr. Rose is a Professor in the Edward S. Rogers Sr. Department of Electrical and Computer Engineering at the University of Toronto, where he currently is Director of the Engineering Business Minor; he was chair of the department from January 2004 through June 2009. His research covers multiple aspects of field-programmable gate array integrated circuits. In honouring Dr. Rose, Engineers Canada describes him as "one of the most committed and effective professors in the University of Toronto's Faculty of Applied Science and Engineering." A fitting tribute for an educator who has received the ECE departmental teaching award four times, and also won the Faculty Teaching Award. His classroom techniques occasionally take a page from improvisational theatre, such as asking students to yell out answers simultaneously. The fifth Masoud Farzaneh Award ceremony took place during the International Workshop on Atmospheric Icing of Structures (IWAIS 2015), which was held at Uppsala, Sweden, on June 30, before dignitaries and scientists from about thirty countries. Dr. Masoud Farzaneh, after whom the award is named, is IEEE Fellow with Quebec City Section and Chairholder of the NSERC/Hydro-Quebec Industrial Chair on Atmospheric Icing of Power Network Equipment (CIGELE) at Université du Québec à Chicoutimi (UQAC). The recipient for 2015 is Dr. Lasse Makkonen, honoured for his contributions to modeling of ice and snow loads on power lines. Dr. Makkonen was born in Helsinki, Finland and studied geophysics and meteorology at the University of Helsinki. He joined the Finnish Institute of Marine Research in 1977, working at the Sea Ice Service and doing research on marine ice accretion. In 1983 he was awarded the NSERC Government of Canada Visiting Fellowship, during which he developed and verified the theory of icing by wind tunnel experiments at the National Research Council of Canada and University of Alberta. This led to a pioneering numerical model of icing on power lines. In 1985 Dr. Makkonen joined Technical Research Centre of Finland (VTT), where he has worked since, apart from periods of visiting professorships in Canada and Japan. Currently Principal Scientist, he has worked in various projects from basic science to applications, mainly related to ice and snow physics, icing and ice prevention. Among the customers of VTT are power utilities, tower owners, sensor manufacturers, and regulatory authorities, from all around the world. Dr. Makkonen has had an important role on international committees, such as ISO Atmospheric Icing of Structures, COST 727, and International Advisory Committee of IWAIS. He has also served as Council Member and Journal Editor for the International Glaciological Society. Dr. Makkonen's widely utilized models of icing cover all types of icing phenomena, i.e., in-cloud icing, freezing precipitation, wet snow accretion, hoarfrost formation and icicle growth. They are applied, in particular, to the probabilistic design of high voltage lines. Dr. Makkonen has also developed the probabilistic extreme value method to that purpose. 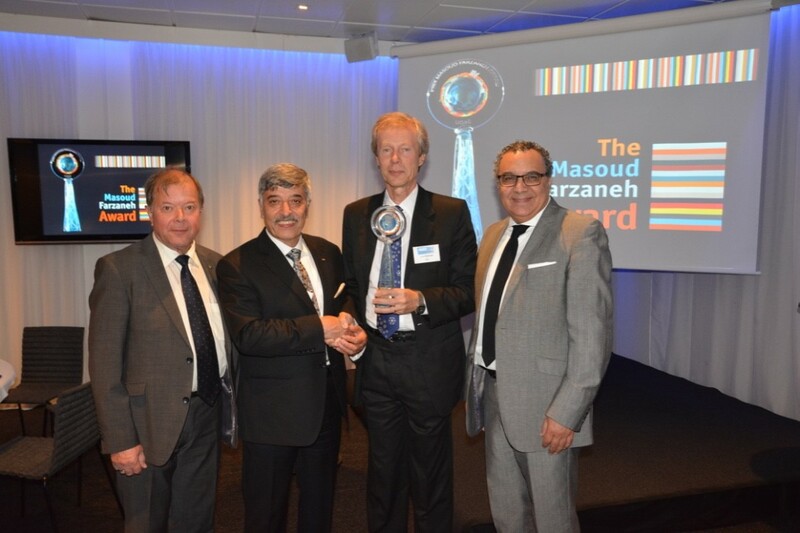 This prize was established in 2010 by UQAC, in honor of Professor Masoud Farzaneh, an internationally renowned researcher in the field of power transmission and distribution in cold climate regions whose contributions and impact has made UQAC a world leader in this domain. This prize is awarded annually till 2017, and then biannually, every odd year to a researcher for outstanding contributions related to the field of power transmission and distribution, in cold climate regions. The prize is accompanied by a trophy which is a work of art created by the renowned artist Guiseppe Benedetto. It consists of a pylon supporting an insulator representing the terrestrial globe and electric energy.